Welcome to the Professorship of Plant Developmental Biology at TUM! We are interested in the genetic and molecular basis of the regulatory pathways controlling organ development and tissue morphogenesis. The lab is located at the TUM School of Life Sciences Weihenstephan. It is a member of the collaborative research centre "Molecular mechanisms regulating yield and yield stability in plants" (SFB 924) and the research unit "Computational morphodynamics of plants" (FOR 2581). SUB:EGFP signal at plasma membrane and plasmodesmata (PD). 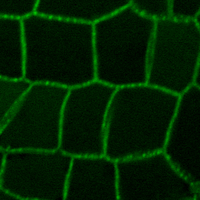 The Schneitz lab works on the signaling mechanisms regulating tissue morphogenesis and the size and shape of organs. In plants above-ground organs, such as leaves or flowers, ultimately derive from the shoot apical meristem (SAM) located at the tip of the growth axis. The SAM and lateral organs are composites of distinct cell layers. We are interested in the inter-cellular signaling pathways that control the necessary coordination of cellular behavior within a cell layer and across different cell layers. 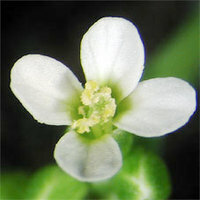 In the experimental work the lab focuses on the model plant Arabidopsis thaliana. 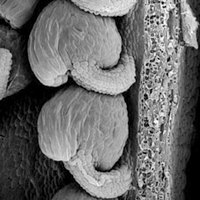 In particular it employs the flowers and the ovule, the major female floral organ required for sexual reproduction in higher plants, as model organs to address inter-cellular signaling during tissue morphogenesis. As necessitated by the biological question the lab uses a broad range of different techniques, ranging from classical genetics and molecular biology to modern proteomic approaches, advanced imaging methodology (CLSM, FRET-FLIM), and computational cell and developmental biology. Prof. Dr. Kay Schneitz: kay.schneitz[at]tum.de. 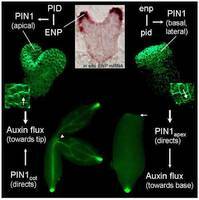 The Torres Ruiz lab concentrates on the analysis of key genes of Arabidopsis thaliana involved in the elaboration of the apical region of the embryo, in particular on key genes of cotyledon development. Some of the analyzed genes also control specific processes of late plant development as well as the shape and size of the plant. More recently the lab has begun to carry out a genome- and transcriptome based project which aims to analyse polyploidy in Arabidopsis and other plants. This also includes the study of chromosome structure. Prof. Dr. Ramon Torres Ruiz: ramon.torres[at]wzw.tum.de. Our present research is funded by the German Research Foundation (DFG), the Free State of Bavaria, and the TU Munich. We are super-excited to welcome Barbara Leśniewska as a PhD student! Congratulations to Sebastian who sailed effortlessly through his PhD exam.